1)3000mAh Ni-MH AAA 1.2V Rechargeable Battery. 3)Up to 1,000 recharge cycles. 4)Environmental friendly and energy efficient. 5)No memeory effect,high energy density. 1)Use a specified charger . 2)Do not disassemble the battery. 3)Do not short circuit the battery terminals. 4)Do not throw the battery into fire or heat. 5)Keep the battery in a cool dry surrounding if it stands by. 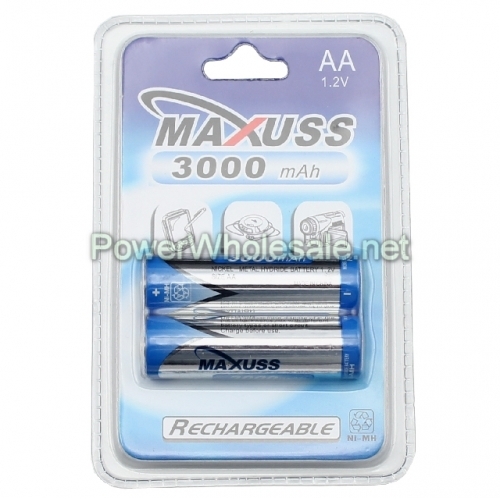 Tell us what you think about MAXUSS AA 3000mAh 1.2V NI-MH batttery(2pcs), share your opinion with other people. Please make sure that your review focus on MAXUSS AA 3000mAh 1.2V NI-MH batttery(2pcs). All the reviews are moderated and will be reviewed within two business days. Inappropriate reviews will not be posted.